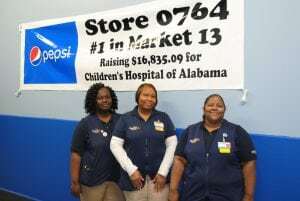 Store #764 in Bessemer, AL is ready to kickoff fundraising this year! The entire store is involved from cashiers to the jewelry counter! We are so proud of their efforts to raise $18,147 in 2017 and can’t wait to see how much they raise for their local Children’s Miracle Network Hospital, Children’s of Alabama in 2018! Previous post: Miracle Monday – Meet Morgan!